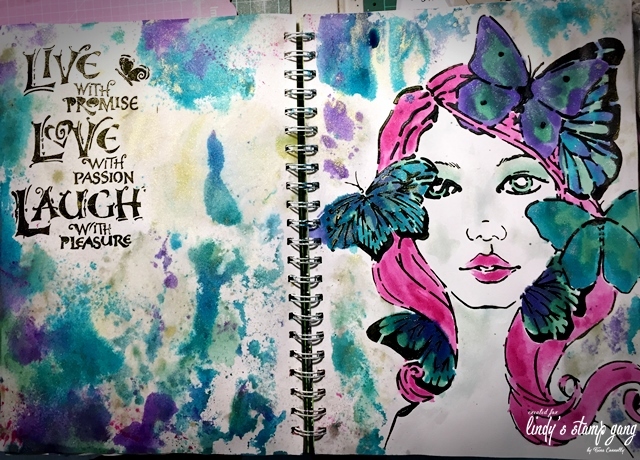 Hi there, I decided to try some art journalling using the Lindy’s Stamp Gang colours from the June Colour Callenge Set. I applied black Gesso through a couple of stencils and allowed it to dry. Pirates Plunder Gold Moon Shadow Mist and Steel Shimmer Glitz Spritz were sprayed over the background. Her hair was painted with Cheshire Cat Cherry Starburst Spray, and then a few splatters made by flicking the brush. The butterflies were coloured with Shabby Turbine Teal. I wanted to introduce a few more colours, so I used Time Travel Teal and Witches Potion Purple. Spray a mix of colours onto a non-stick sheet and press it onto your page. This will give a different effect than you would achieve by spraying. Spray Cheshire Cat Cherry through a stencil, and press the excess onto the page. 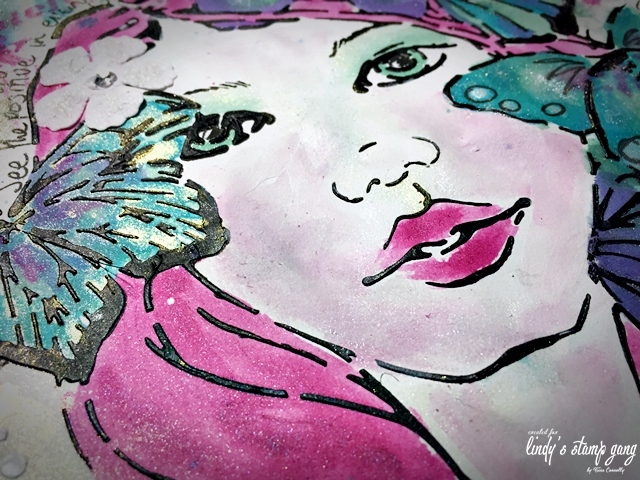 Paint some details on the butterflies using Twinkling Tinsel. Once dry, stamp with Stazon, and add more detail and some quotes with a journal pen. I added some colour to her face by using the mists as watercolours. Thanks for joining me on the blog today. Hope you were inspired to create! She’s beautiful Tina. I have this stencil but only used it once and then not all of it sooooooooooo this is VERY INSPIRING to me. And I absolutely love that you did it with Lindy’s, of course!!! The colors are SPECTACULAR. Thanks bunches for sharing. j. Two beautiful journal pages. The image/sentiment are wonderful and the colors are perfect.